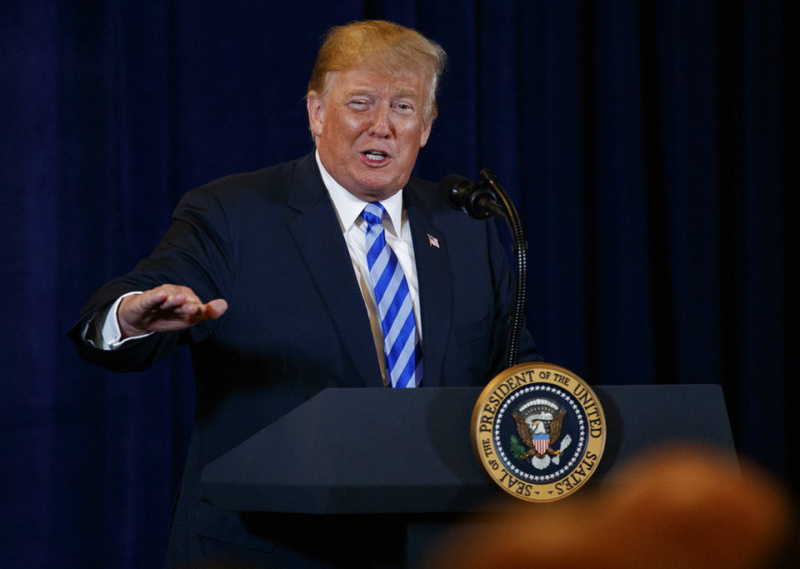 NEW YORK (AP) — Newspapers from Maine to Hawaii pushed back against President Donald Trump's attacks on "fake news" Thursday with a coordinated series of editorials speaking up for a free and vigorous press — and, not surprisingly, Trump didn't take it silently. They did across the breadth of the country. The Portland (Maine) Press-Herald said a free and independent press is the best defense against tyranny, while the Honolulu Star-Advertiser emphasized democracy's need for a free press. "The true enemies of the people — and democracy — are those who try to suffocate truth by vilifying and demonizing the messenger," wrote the Des Moines Register in Iowa. In St. Louis, the Post-Dispatch called journalists "the truest of patriots." The Chicago Sun-Times said it believed most Americans know that Trump is talking nonsense. The Fayetteville Observer said it hoped Trump would stop, "but we're not holding our breath." "Rather, we hope all the president's supporters will recognize what he's doing — manipulating reality to get what he wants," the North Carolina newspaper said. On Thursday morning, Trump took to Twitter to denounce the effort, saying the Globe was in collusion with other newspapers. He wrote: "THE FAKE NEWS MEDIA IS THE OPPOSITION PARTY. It is very bad for our Great Country....BUT WE ARE WINNING!" The Morning News of Savannah, Georgia, said it was a confidant, not an enemy, to the people. "Like any true friend, we don't always tell you what you want to hear," the Morning News said. "Our news team presents the happenings and issues in this community through the lens of objectivity. And like any true friend, we refuse to mislead you. Our reporters and editors strive for fairness." Some newspapers used history lessons to state their case. The Elizabethtown Advocate in Pennsylvania, for instance, compared free press in the United States to such rights promised but not delivered in the former Soviet Union. "If you haven't already, please subscribe to your local papers," said the Times, whose opinion section also summarized other editorials across the country. "Praise them when you think they've done a good job and criticize them when you think they could do better. We're all in this together." That last sentiment made some journalists skittish. Some newspapers, including the Wall Street Journal and the San Francisco Chronicle, wrote editorials explaining why they weren't joining the Globe's effort. The Chronicle wrote that one of its most important values is independence, and going along with the crowd went against that. Both the Chronicle and Baltimore Sun said that it plays into the hands of Trump and his supporters who think the media is out to get him. Nolan Finley, columnist and editorial page editor of The Detroit News, spoke up for the press but added a scolding. He said too many journalists are slipping opinion into their news reports, adding commentary and calling it context. "Donald Trump is not responsible for the eroding trust in the media," Finley wrote. "He lacks the credibility to pull that off. The damage to our standing is self-inflicted." The Radio Television Digital News Association, which represents more than 1,200 broadcasters and web sites, is also asking its members to point out that journalists are friends and neighbors doing important work holding government accountable. "I want to make sure that it is positive," said Dan Shelley, the group's executive director. "We're shooting ourselves in the foot if we make this about attacking the president or attacking his supporters." Associated Press correspondents Hannah Fingerhut, Skip Foreman, Amanda Kell, Jack Jones, Herb McCann, David Runk and Juliet Williams contributed to this report.